I’m not a huge collector of postcards, but given my interest in old buildings of Anglesey, I do keep an eye on eBay for new listings of particularly interesting old images of past and present structures. I usually go for ones that show intriguing differences between then and now, or simply attractive ones. My latest acquisition ticks both boxes. The above image is a view of Beaumaris Castle unlike any that you’ve probably seen before. 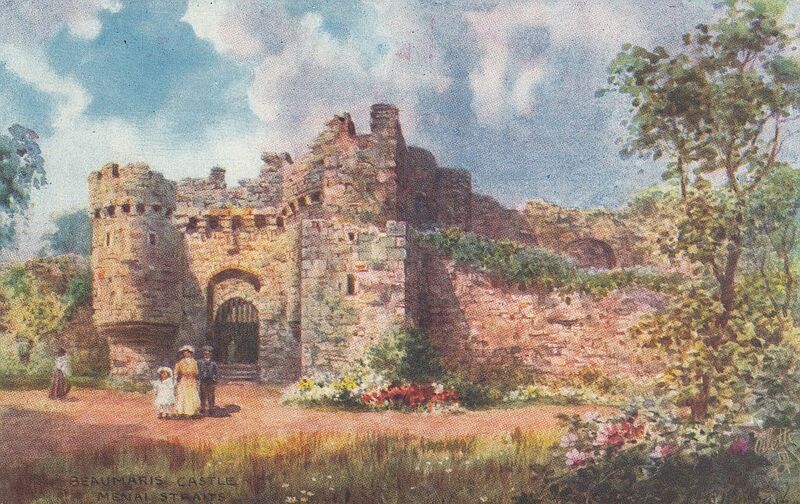 An Edwardian family pose in front of a castle gateway, with the walls draped with vegetation and bordered with colourful flowers. 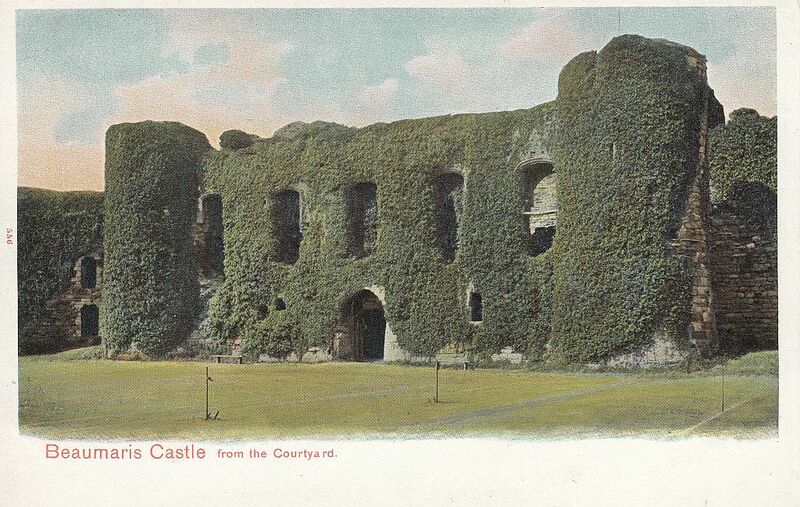 But, is this really Beaumaris Castle? Where’s the moat and bridge? Compare it to a recent photo of mine from the same viewpoint and you can see that it is definitely the gateway to Beaumaris Castle. However, unlike the restored and highly popular visitor attraction that it is today, in the 19th and early 20th century it was a ruin that attracted the interest of the Victorians, who sought out romantic views of ancient buildings. Beaumaris Castle was built by Edward I in the late 13th century, after he conquered Wales. It was never finished to its full height, and only occasionally saw military action, most notably during Owain Glyndŵr’s revolt and the English Civil War. It was bought from the Crown by Thomas Bulkeley of Baron Hill in 1807 for £735. The Bulkeley family had been constables of the castle for generations. They treated it as a romantic Victorian ruin, but also used it for battles of another sort, with a tennis court built in the inner ward, as you can see in this picture. The Bulkeley family gave the castle to the State in 1925. 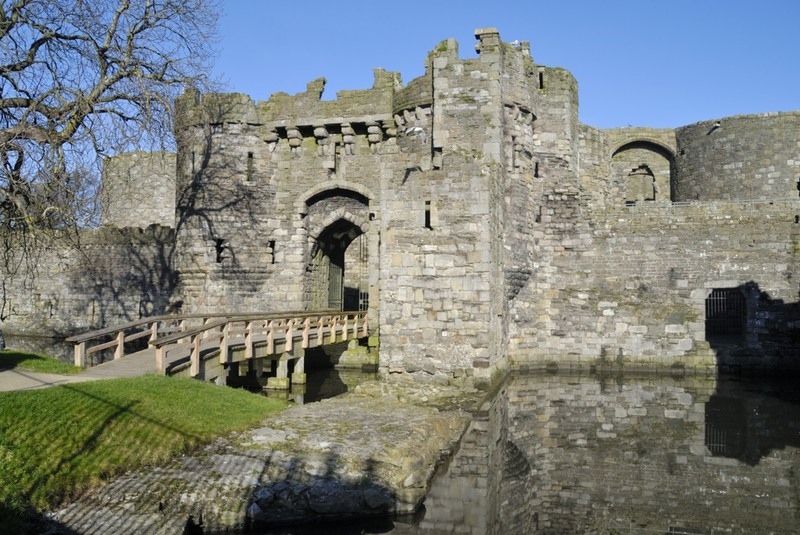 The Commissioners of Works, the predecessor of today’s Cadw, soon set about doing major reconstruction work, removing vegetation from the walls, repairing stonework, and restoring the moat. It is now one of the most popular visitor attractions on Anglesey and was declared a UNESCO World Heritage Site in 1986 (along with Conwy, Caernarfon & Harlech Castles). This new postcard is from the Tuck company’s “Picturesque North Wales” series, appearing in their 1911-12 catalogue. It was painted by Henry B Wimbush, a London-born landscape artist who did many illustrations for the Tuck postcards, as well as for book publishers such as A & C Black.